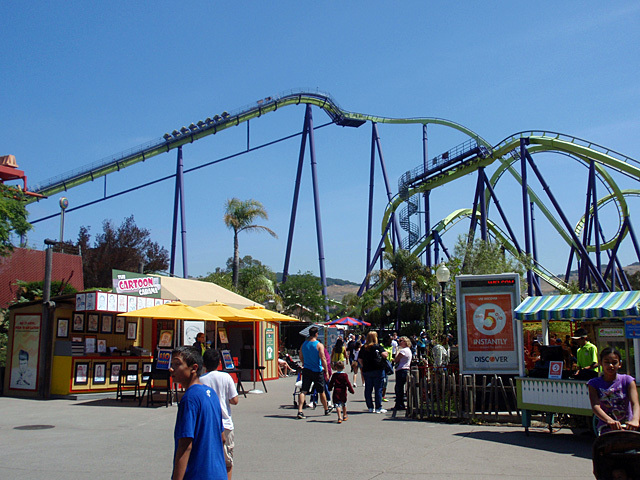 Medusa is the tallest, fastest, longest and most technologically advanced roller coaster in Northern California, the first floorless coaster on the West Coast and the tallest, fastest flying coaster in the West! Roller coaster experts call Medusa the 'finest steel roller coaster in the world.' The unique floorless design of this serpentine supercoaster allows riders to experience an unrivaled feel of flying, as they soar over Medusa's 150 foot first drop and travel at 65 mph on open-air pedestal-like seats with legs dangling! Medusa hurtles riders through 4,000 feet of track and seven inversions, including a never-done-before set of back-to-back super loops called the 'Sea Serpent.' Medusa - the beast in a pack of wild rides at Six Flags Marine World.